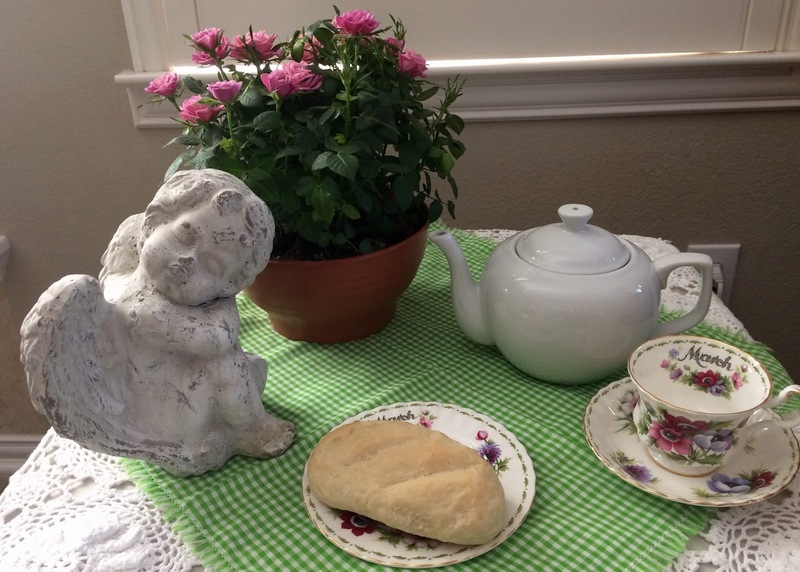 Let's break bread together for tea time! Isn't the potted rose plant that my neighbor gifted me for my birthday, so pretty? The sweet cherub is hoping for Spring to arrive soon! 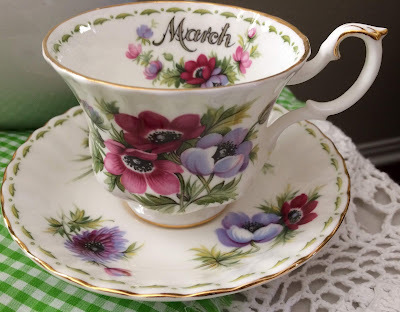 My friend, Colleen, gave me this March Royal Albert trio set, and I think it's such a pretty one. I had four of my grandchildren over during Spring break and I was one happy Nana!!! It was so nice to see these cousins together in my home. We went to Chick-Fil-A for lunch, which is always a favorite. However, before we went to lunch, we prepared the dough for the French Bread, and let is rise while we were gone. Here they are rolling out their dough to make their twisted green and white St. Patrick's Day breads to take home. Here are their finished loaves! They took nibbles of their bread because it was hard to resist that warm bread from the oven, especially with Irish butter. This bread is a cinch to make because it's done in the food processor. I often use this recipe for pizza dough, or I'll use the French Bread for French Bread pizza. I hope you'll try it. The kids also make bunnies from socks, which turned out so cute! They love doing crafty things. I had lunch with my daughter, and her three boys. Cissy was busy with friends. I had my two youngest grands over for a Saturday visit. 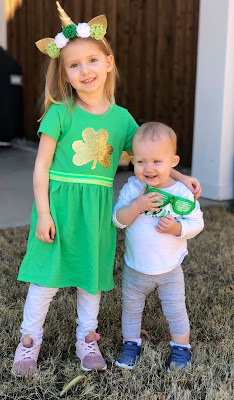 Don't these sweet sisters look cute in their St. Patrick's Day outfits? Every time I see your grandchildren together I am struck at their resemblance. How wonderful you were able to share fun times with them all. Gosh your grandsons are growing tall, Kitty. We will have to give this a try! We make pizza dough in our bread machine regularly. Occasionally we buy french bread to make pizza but I never thought to make our own french bread! Oh those beautiful (and handsome) grands! Your daughter is so pretty and very proud of her fine looking boys. What a great group! Is Cissy the only daughter? I imagine her brothers take good care of her. Oh what fun! 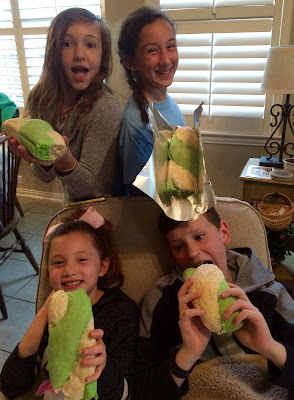 I bet they loved making french bread and what a fun idea for St. Pat's! So glad you could spend time with your grands, they are all adorable! Hi Kitty! I love your table, so sweet and cheerful with the green cloth,the pretty angel and that divine trio.Your bread looks great too!How adorable your family is...A real treasure!Hugs! How I could forget the cute pink flowers...Cute! You have such lovely grandchildren and your daughter is just so pretty like you! 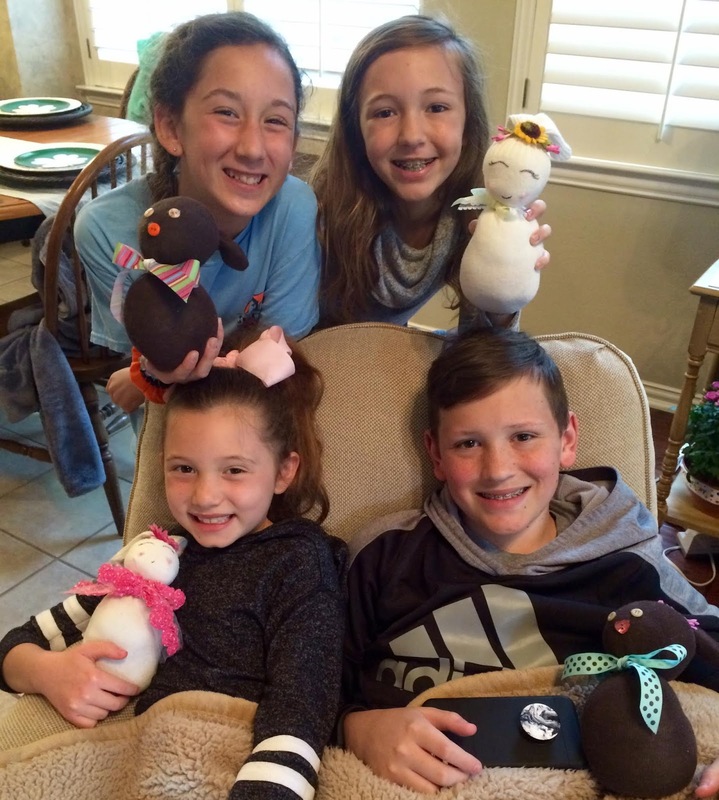 You all must have had so much fun making the bread and crafting the sweet sock bunnies. Look at the smiles on all those faces...what a fun times! The green and white bread looks so fun and no doubt had to be just as delicious. Happy Spring to you, dear Kitty! You really do such wonderful things with your Grands, Kitty! I can imagine how delicious the French bread was warm from the oven with good butter :) My goodness the two oldest boys must be really tall! Kitty, love the sweet family photos. 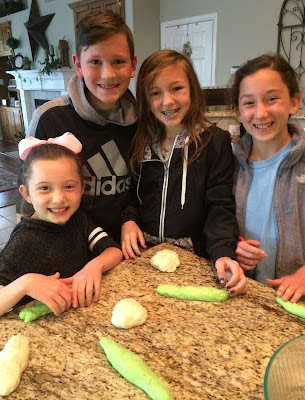 Bread is one of my favorite things to make, and it really delights me to see you getting the grands involved in it! You make the bread making process sound so easy! Even though I’ve been working at it for a minute, it’s still intimidating for me. I’ve gotten cinnamon rolls down pretty good, but I guess it’s one step at a time. To make French bread from scratch? I’d be on Cloud 9!!!!!!! I’m glad you had a fun and loving weekend with your family! 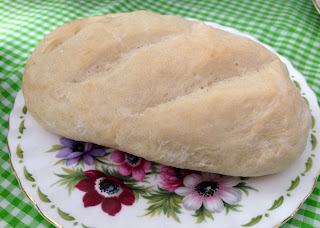 A lovely post, many thanks for sharing your recipe. Loved the photographs of your grand-children. Well the bread looks wonderful but those pics of the grands and the fun you had are adorable! What a fun day you all had! The birds are singing here, the Robins have returned and the days are longer . . . all happy things for me!! You MADE French bread?! Well, I am duly impressed! I tend to avoid such things fearing a poor outcome, but yours looks wonderful. Those photos are just cute all the way around! Those grands did a fabulous job with their French bread. 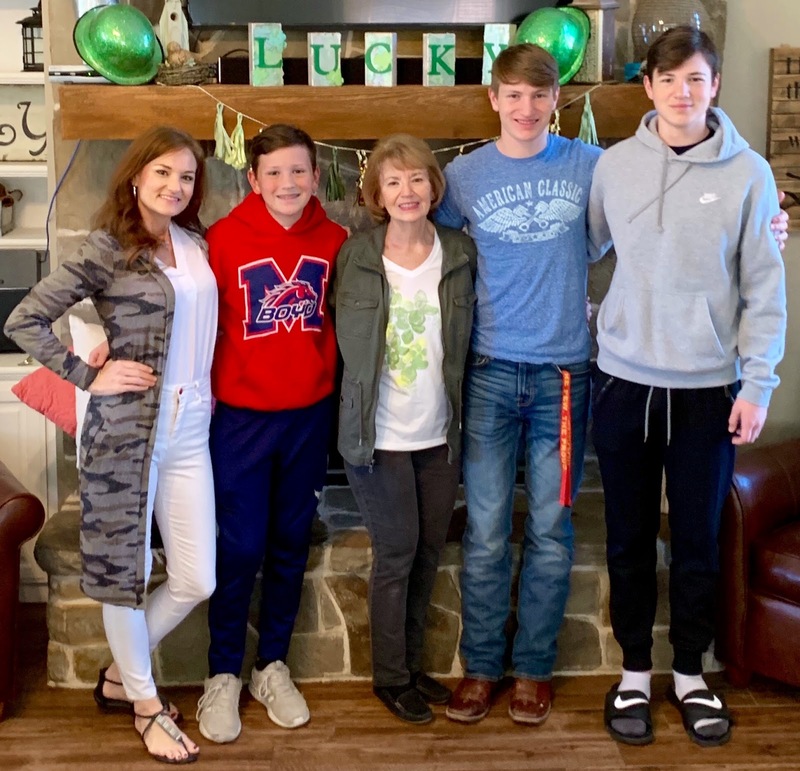 Happy for you that you got to enjoy having them during their spring break. What a fun project for your Spring Breakers, looks like you had a house full. Our Spring Breakers are much older now and sometimes I miss the days when they were younger and we could do fun projects. Your french bread looks delicious and a great recipe. Hope you are enjoying the spring weather we are having, and didn't get to much hail in the storm, we had some hail but not very much, no damage. Thanks for sharing with us at Full Plate Thursday and have a good week!